Emeco builds great chairs. 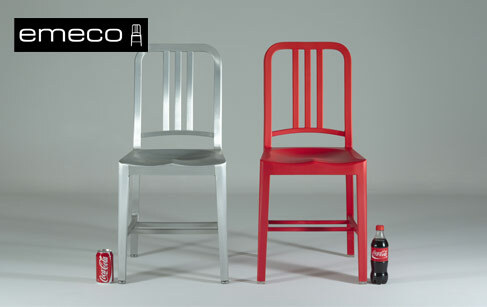 Since 1944, Emeco has been focused on a single goal: combining the best materials with the highest skilled craftsman. Quality hasn't been an accident. It's about process and people. Emeco chairs have become universal within the design community. The Navy Chair and its descendants grace fashion spreads, hotels, restaurants, offices, television, and feature-length films. They have played an integral role in great spaces for over half a century. The original aluminium 'Navy' 1006 chair was designed to be used in submarines in 1944 by Emeco. The company's manufacturing process is the result of a collaboration between Emeco and the US Navy to develop a seaworthy chair for military use. The 1006 Navy Chair is made of recycled aluminium, using 77 steps to create a seamless one-piece look. The Navy Chair was a chair so durable, it had an estimated life cycle of 150 years and far exceeded the Navy’s specifications. In the post-war years, Emeco branched out, outfitting not only The Navy but also federal prisons, state hospitals and government offices. Hundreds of thousands of chairs were handmade and sold to the government. In 1998, Gregg Buchbinder purchased Emeco and repositioned the company making chairs for architects, designers and retailers. He started working with names like Philippe Starck and Frank Gehry and Ettore Sottsass… and the rest is history—a history that is not only still relevant today but Emeco hasn’t stopped innovating. They just released a new chair by Starck that’s essentially made from rubbish and an armchair by Konstantin. The 77 steps used to create a Navy Chair hasn’t changed over the past 70 years. It takes three days of work by 12 to 14 different craftsmen to make an Emeco 1006 Navy Chair. The 1006 chair is made by hand by skilled craftsmen, some of whom have been with Emeco for over 45 years perfecting their skills. Emeco’s factory in Hanover is one of the few remaining manufacturing plants in the area and relies on the local heritage of manufacturing expertise brought to the United States by German immigrants over 100 years ago. Emeco looks towards the future by implementing the latest manufacturing techniques and apprenticeship programs.